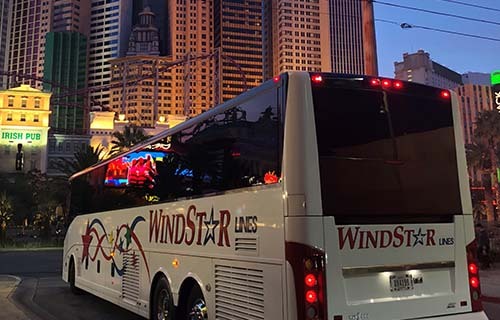 At Windstar Lines, we thrive on treating all of our customers like VIPs, especially when it comes to entertainers and bands. We know that it is essential not only that, as performers, you get from place to place safely, but also comfortably and in style. With such an extensive fleet available at locations all across the country, all of our entertainer coaches and band tour bus rentals are sure to impress, whether you are looking for something simple for your airport transportation or something higher end with all the amenities you need to travel comfortably for weeks on end. Figuring out which features you want and need can be overwhelming, so we encourage you to check out our fleet to decide. As always, though, contact us with any questions and we are glad to tell you more about the various conveniences we have to offer. Our entertainment experts can help you schedule your entire itinerary, making sure that all of your transportation needs are set. We can provide any number of the services above, along with just about anything else you can think of to make sure your tour is one to remember.